That presumably explains why we hear so many readers clamoring for AudioCopy. It’s a proprietary audio API developed by Sonoma WireWorks with an available SDK, and it’s gained some real traction among iOS music apps. Latest to the fold is ReBirth, the iPhone and iPad all-in-one music studio. (A corresponding price cut makes the iPad version US$9.99 and iPhone edition $4.99, though if you have a choice, I’d avoid the iPhone version and stick with the iPad.) I know this was an oft-requested feature. Jasuto is a full-fledged modular environment. VoiceJam from TC-Helicon is a vocal sampler and looper. …and, of course, there are countless synths and other interesting sound generators, including Korg’s offerings and various tools we’ve covered on CDM. But it’s nice to see these tools in the mix, too, in terms of workflow. I’m still partial to the far more open and capable conventional computer as a way of working, but what’s interesting to me is that part of what many want on mobile is the same sort of studio-in-a-box flexibility. 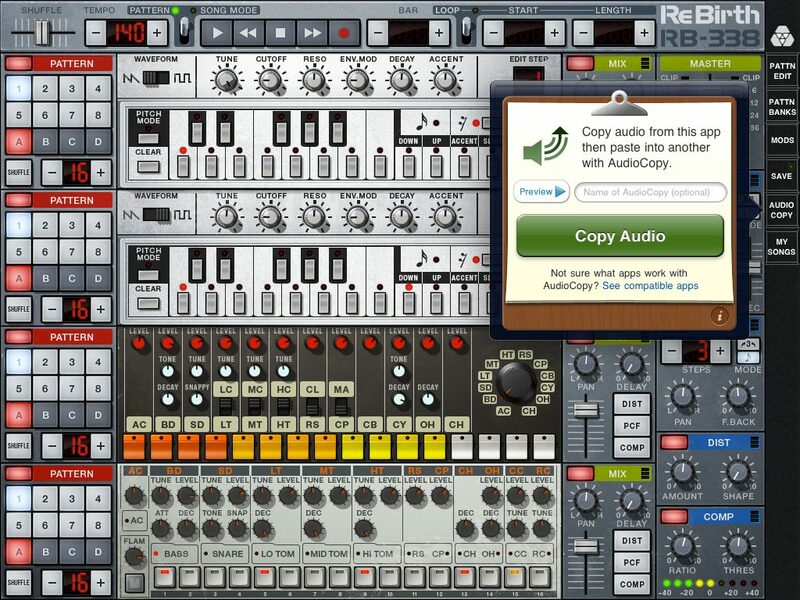 And there’s no question that with these tools, you can get music made. There are efforts to route signal between apps, too, but what’s nice here is that you still focus on one app at a time – avoiding performance bottlenecks in either their device or your attention span. If you do use iOS, let us know which apps you use with AudioCopy.